House completely renovated for your comfort. 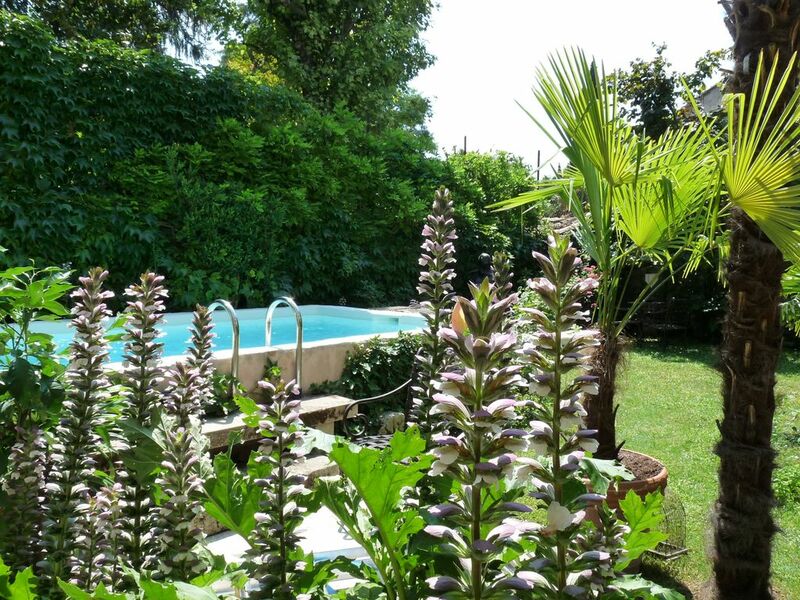 Enjoys an indoor garden and a swimming pool with counter current, shared with the owners. The upstairs bedrooms offer a beautiful view of the old medieval city. privileged oasis of calm and greenery just two minutes walk from the city center, the many tours and activities available and all amenities. Ideal to enjoy quality recreation on site or nearby. or Les Chorégies in Orange, the Festival d 'Avignon and all the artists performing at Vaison on their summer tour. Ideal starting point for many walks in cycling, a notebook of the most beautiful cycling circuits is at your disposal or by car to Mont Ventoux for winter sports, to the sea towards the Camargue or in the Calanques of Marseille. To enjoy good food, many chefs are there to take you to discover all the specialties of Provence. Bathroom upstairs, completely renovated. with washing machine. Dining room table with 6 chairs and three seater sofa with TV. Kitchen on the ground floor. Private dining area shaded in the courtyard in the garden. We were able to park our car for free and walk wherever we wanted to go. Short walk to shops and square. Easy walk to Roman ruins and upper town. Rooms were comfortable and kitchen was very well equipped. It was cold when we were there and we had to rely on electric heaters in each room and keeping doors closed. The hallways were quite cold. Still, we found it a great place to stay, and the hosts were very helpful. This spacious apartment is ideally located, two blocks from the downtown square of lively cafes, restaurants, shops and bakeries, a 5 minute walk to either the old town or the Roman ruins and a 10 minute walk to the supermarket. It’s also quick and easy to get out of town and explore wine country. Parking in the street is sometimes hard to find but there is a large free parking lot just around the corner and down the street, which is very convenient. The apartment is on two levels, well maintained and tastefully decorated. The only drawback is that in hot weather the bedrooms can be too warm at night as very little breeze comes in from the courtyard and there is no air conditioning unit. There is a small shared garden area in back and a pool for cooling off. Hosts William and Rose live in a different part of the same building and are very kind and accommodating, always available to answer questions and offer suggestions. Our stay in Vaison-la-romaine was sensational. We loved every minute and it was all enhanced by staying as a guest of William and his family in his gorgeous apartment. It was so very spacious and we had our choice of bedrooms a queen bed or two singles upstairs. It was really spacious with a fully equipped kitchen that leads out to a charming garden with a glorious pool, where you can sit outside and enjoy the vista, looking up to the old town. There's a small lounge with a dining table that we hardly used as there's so many fabulous restaurants to choose from in the immediate area as it's only 50 metres to the heart of the village. It was also great to have a bathroom that included a washing machine - very welcome after travelling for a few weeks. From our bedroom, we had magnificent views up to the old town which was really beautiful to wake up to each day. Parking was not an issue as there's plenty of free parking nearby. From Vaison, we travelled to amazing places for day trips but we always enjoying coming 'home' to this beautiful spacious apartment that really had a lovely French charm. It was also very private, feeling that we had the complete building to ourselves, although good to know that William and his family reside next door. We would highly recommend this property to anyone travelling to this region. Wir haben in diesem kleinen Paradies leider nur 5 Tage verbracht. Der Pool und der Garten sind einfach herrlich. Rose ist eine sehr zurückhaltende und liebenswürdige Gastgeberin. Unsere Kinder waren von den Schildkröten im Garten begeistert und haben viel Zeit bei ihnen verbracht. Der Ort ist sehr lebendig. Un havre de paix et de verdure en plein centre ville. Avons passé un excellent séjour. La maison est très bien située, tout près des commerces du centre ville et il n'y a aucun problème pour garer la voiture gratuitement. Les chambres sont spacieuses et meublées avec goût, la cuisine bien équipée et le jardin très agréable. Les hôtes sont charmants et attentionnés. Nous reviendrons avec grand plaisir. merci de votre commentaire; cela a été un plaisir de vous recevoir. Das Haus befindet sich sehr zentral in Vaison, so dass man sofort mitten im bunten Leben der Stadt ist, sobald man vor die Türe tritt. Die Wohnung ist auf den Fotos gut getroffen, im Erdgeschoss ist eine Küche und ein Ess-/Wohnzimmer, im OG drei Schlafzimmer und das Bad. Von der Küche aus gelangt man in den herrlichen Garten, den Rose, die Vermieterin, mit sehr gutem Auge und einem geschickten Händchen eingerichtet hat. Rose und William wohnen im übernächsten Haus, sind immer ansprechbar aber auch sehr diskret und nie aufdringlich, also sehr angenehme Gastgeber. Rose spricht auch gut Deutsch, was die Kommunikation manchmal doch erleichtert, wenn man selber nicht soo fließend im Französischen ist. Die Zimmer sind einfach aber sauber und geschackvoll eingerichtet (siehe Bilder) und das Haus ist ein toller Rückzugsort im Trubel der Stadt. Wenn man im Garten sitzt oder vom Bett aus über die Palmen zum alten Schloss schaut, ist man in einer ganz eigenen Welt. Der Garten ist sehr schön angelegt und beherbergt drei freilaufende Schildkröten und drei sehr sympathische Katzen, die sich aber alle sehr unauffällig verhalten und uns nie gestört haben. Verlässt man die Wohlfühloase Richtung Straße, ist man nur 3 Gehminuten von 3-4 Bäckereien, dem Zeitungskiosk und den Restaurants, Brasseries und Bistrots des Zentrums entfernt. Obwohl es eine schmale Straße ist, haben wir in den zwei Wochen unseres Aufenthalts immer einen Parkplatz vor der Türe gefunden, falls die Straße mal voll ist, gibt es noch den großen freien Parkplatz am Fluss, nur 50m weiter. Der Mai 2013 war auch in der Provence relativ kalt (tagsüber 18-22°C), weshalb wir nicht in den Genuss des Pools gekommen sind (wussten wir vorher!). Dafür konnten wir erfreut feststellen, dass es für fröstelnde Gäste die Möglichkeit gibt, die Zimmer mittels Elektroheizungen auf Temperaturen zu bringen, die ein angenehmes Dasein ermöglichen. Alles in allem eine sehr angenehme Unterkunft für Menschen, die gerne auch mal relaxen möchten, aber es auch genießen mal Zeit am Markt (Dienstag!) und in den Cafés und Geschäften zu verbringen, ohne jedes Mal ins Auto steigen zu müssen. Vaison ist für uns auch deshalb immer wieder schön, weil es gerade etwas größer ist als viele der sehr kleinen, pittoresken Dörfer der Provence und es in Vaison „echtes Leben“ gibt, mit freundlichen Menschen die dort arbeiten, leben, plaudern, essen und einkaufen. Gallo-Roman sites of Vaison la Romaine, Cathedral, Roman Theatre, Upper Town and medieval castle. Festival of Avignon at 50km. Ancient Theatre of Orange at 20km. Arenes de Nimes to 80Km. Caution de 300 € à l'arrivée rendue en fin de séjour si tout est OK. Ménage final, consommation d'eau, d'électricité et linge de maison COMPRIS.